Bob and Susan Onion of Biggsville took The Quill on a 4,000 mile vacation to the Eastern Sea Coast and 11 New England states in October to see all those beautiful fall colors. They got a bonus as they saw fall colors with snow on them, too. 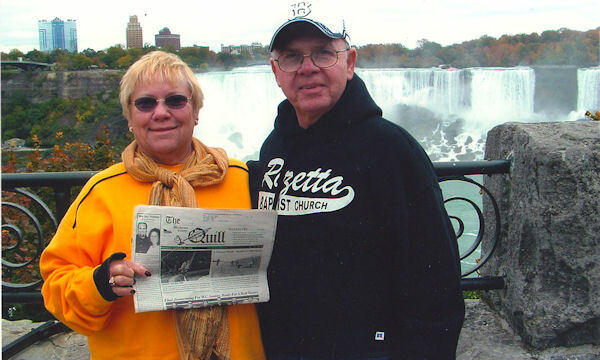 They make a stop to see Niagara Falls in Canada as well as in New York. When you go on a trip, take "The Quill" along and have your picture taken with it, and send it to us. Let's see where The Quill" can travel.